Gift cards are a very popular way to bestow your tidings of goodwill and cheer onto family or friends. We often buy gift cards because we don’t really know what it is the recipient wants or we’d like to give them the freedom of selection. Imagine a website where you can know exactly what your recipient would like for their birthday, Christmas, wedding or (even) Bar Mitzvah! Well, we now have that option with Card Avenue, an easy-to-use online retailer of gift cards which gives the user an option to create their own gift registry to celebrate a wide range of occasions. I was able to create my own birthday gift registry within minutes through the site (feel free to check it out here). I added 10 merchants to my registry. When I finished creating it, Card Avenue gave me the option of sharing my registry via Facebook, Twitter or by email. Pretty cool. When someone on your list goes to your registry page, they have the option of buying a gift card direct from the retailer, buying a discounted card through Card Avenue and entering the amount of gift purchased (so that others don’t buy you duplicates). This is truly a unique site and I urge you to give it a try yourself. As a way of getting the word out on Card Avenue, they are generously providing one lucky TTG reader a $75 gift card to use at Home Depot. To enter, all you need to do is one or all of the following. Obviously, the more you do, the better your odds. Contest will end at 11pm CST on 10/26. A winner will be selected on the 27th. Best of luck! Please send an email to contests@threethriftyguys.com, letting us know what you have done. Thanks! Thanks for playing everyone! A winner has been notified. 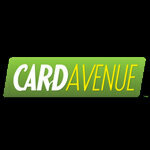 Card Avenue is new to me – sounds like a great thing though! Especially for me seeing I’m far from my family – this way we can shop for one another easily. Emailed you all the info for what I’ve done for the contest! Thanks for entering everyone. Just a reminder to send an email to contests@threethriftyguys.com letting us know what you’ve done. I liked cardavenue on fb!